You are riding in your car when you pass a big rig. You catch the driver’s eye and pump your arm in the universal symbol pleading, “Please blow your horn.” The driver complies, and the blast thrills you. Even joggers on main roads pump their arms, hoping to hear that spine-tingling train horn blast. What exactly are these sound devices that have so captured the imaginations of the general public? Train air horns originated as audio warning devices on trains, of course. As engine technology developed and the diesel locomotive replaced the steam engine, the steam whistle became unworkable as a warning device. To fill that need, the air horn replaced the steam whistle. An air horn works by sending compressed air through a supply line into a power chamber. The power chamber channels the compressed air through a diaphragm and into a horn bell. On a big rig, air horns can use compressed air from the brakes to power the sound, with the typical air horn sounding at 150 decibels in loudness. The reviews below are organized to help you select the best train horn kit for your vehicle. The PsychoBlasters 127 is a high-quality, high-end train horn kit designed to integrate into as many cars as possible and be as easy to install as possible. While it will still be necessary to understand the specific layout and electrical system of your car in order to install it properly, the PsychoBlasters 127 is designed to have as few parts as possible and require as little drilling and cable running as possible. This helps it to not only be simpler to install, but ensures there are fewer things that can break or go wrong. Despite this, it is one of the most affordable kits on the market, costing hundreds or even thousands of dollars less than competing kits. The PsychoBlasters 127 is built around an oil-less, maintenance-free compressor which, if kept from being exposed to the environment, should last beyond the life of the vehicle where it has been installed. It has mounting brackets with pre-drilled holes, making it easy to install in an existing tool box, truck bed, or within the cab itself. The compressor runs off of the car’s existing electricity. The compressor and reservoir are as small as possible without compromising power, enabling it to be fit easily under a seat or into an already crowded toolbox without taking up too much room. It is also durable, and repeated impacts with tools, boots or other hard objects won’t keep it from working. The PsychoBlasters 127 uses two chrome-plated brass horns designed to be as loud as possible. They are waterproof and extremely durable, enabling them to be mounted on the under frame, within the engine bay, or on the cab roof. They are loud enough that, even if shrouded by exterior metal, they will be very audible, although they will be at their loudest when roof mounted. The chrome plating ensures that they will be attractive and suitably shiny indefinitely, and that impacts from road will, although they may ding the exterior, not reduce the volume or effectiveness. Both of the horns in the PsychoBlasters 127 kit are designed to be easily adjustable, so that the volume can be increased in rural areas or decreased in urban areas subject to noise restrictions. The HK-C3B-232 is intended for large trucks and other vehicles that need to sound like large trucks. The three-horn system is somewhat vertical, which may cause a problem when dealing with clearance issues, but it enables the horn to be optimally positioned for maximum volume. With a two gallon reservoir and an extremely powerful compressor, the HK-C3B-232 is ready for repeated use, recharging quickly to release more noise as needed. The compressor and reservoir are designed to be suitable for all-weather use, but are small enough to be installed in the cab under the seats if necessary. The compressor is rated for 150 PSI, enabling it to pump an extremely large amount of high pressure air through the horns and produce the maximum volume. The connection lines are made in America and rated for aircraft pneumatic use, which is the highest commercial rating available. This means that they are much less likely to fail over the life of the unit and the vehicle they are installed in, and will most likely outlive the vehicle. All of the hose connections are made of heavy-duty rust-proof metal for improved longevity. The horns themselves are chrome-plated for longevity, although it is black chrome to help disguise road dirt and dents over time. The three-horn setup produces a single loud chord, which is ideal for hearing over distance or through sound-dampening materials. Though their height may cause problems for clearance, they are small and compact enough for most mounting positions, and can also be mounted in some engine bays or places other than the roof if clearance is a concern. Kleinn Air Horns has been producing air horns for trucks, trains and other large vehicles for decades, using American-made components and assembly factories in order to maintain a high standard of quality. The Kleinn Air Horns HK7 reflects this by having a sturdy, all-metal construction of waterproof parts, engineered to be able to withstand repeated impacts by tools, cargo or other heavy objects. Despite this, it remains very competitively priced, costing hundreds of thousands of dollars less than other units. Its rugged construction makes it ideal for installation on vehicles where interior installation is undesirable or impossible, although it can be installed inside, in a toolbox, or in another unobtrusive area to conserve space or protect it from particularly heavy objects. The compressor of the Kleinn Air Horns HK7 is rated for up to 150PSI, enabling it to store a large amount of air within the reservoir. This enables the Kleinn Air Horns HK7 to not only be extremely loud, but to be loud for a long time, blaring for many seconds without the need to recharge. The three gallon reservoir holds enough air for a five-second continuous blast, and the compressor will begin to kick in immediately to help reduce the recharge time. The Kleinn Air Horns HK7 uses a three-horn system designed to eliminate clearance issues by being as flush as possible. The flutes are short and squat, despite their power and volume, thus preventing them getting damaged by low clearances. The three horns have been tuned to separate notes together they play a single loud chord, instead of simply a single note. This not only sounds better, it makes them sound louder, as it adds emphasis and depth to the noise. They are harder to ignore, and can also be heard over a greater distance, which is ideal in rural areas where hazards or people who need to listen may be a greater distance away. The K3LA Model 540 sounds like a train horn because it is in fact a train horn, identical in make, power, size and volume to those used on train engines. The only difference is that the Nathan AirChime K3LA Model 540 has been adapted for use on cars and trucks, with the mounting and hookup systems modified for standard automobile mounting options. It is suitably heavy-duty, with appropriately well-crafted and weather-resistant parts. The components are made in America and designed to integrate into the existing frames and can be installed in a single afternoon. The primary downside to the Nathan AirChime K3LA Model 540 is its size and weight. However, many large trucks, or vehicles whose owners want them to sound like large trucks, should have no problem finding places to mount the five-gallon reservoir or the high-powered compressor. All five gallons of air are dumped through the horns at a rate of a gallon per second, making them extremely loud, to the point where it is deafening without ear protection for those standing too close. The reservoir refills from the pump in seconds, enabling the horns to be blown repeatedly after a short recharge. The Nathan AirChime K3LA Model 540 can be heard from miles away, even though the soundproofing present in most modern vehicles. The three horns are tuned to play a chord instead of a single note, both helping to make the sound more audible, sound louder, and also sound better. Despite their power, they are compact enough to be installed externally on most trucks, including pickup trucks. While they do present a clearance issue on some larger vehicles, the mounting brackets are designed to hold the horns vertically for a behind-the-cab installation. Once air horns replaced the steam whistle on trains for practical safety reasons, they also came of use on vehicles needing to ride on tracks, such as track maintenance vehicles. When their safety factor became known, big rig drivers adopted them, also for safety reasons. Nathan Airchime began making train air horns in 1954, so train air horns are a fairly recent innovation for public consumption. Truck air horns are also used on emergency vehicles for safety reasons. Safety aside, truck air horns have become popular for use on cars, trucks, SUVs, motorcycles and marine vessels for reasons of distinguishing a vehicle from the common lot, or “pimping your ride.” An air horn on a passenger vehicle or motorcycle certainly captures attention in driving or riding. These days, any vehicle with a 12 V power source can boast an air horn. In addition to adding pizzazz to a vehicle in a very loud way, adding sound loudness to visual loudness perhaps, train air horns can be used for pranks. Some bicyclists install truck air horns on their wheels to startle hapless pedestrians. Truck air horns have also been used to unsettle golfers as they swing their clubs. In more practical applications, truck air horns contribute to team spirit at sports events, ramping up the excitement and add to the beat of reggae music – a unique kind of instrument. Finding a brick and mortar store which sells train horns is a challenge. 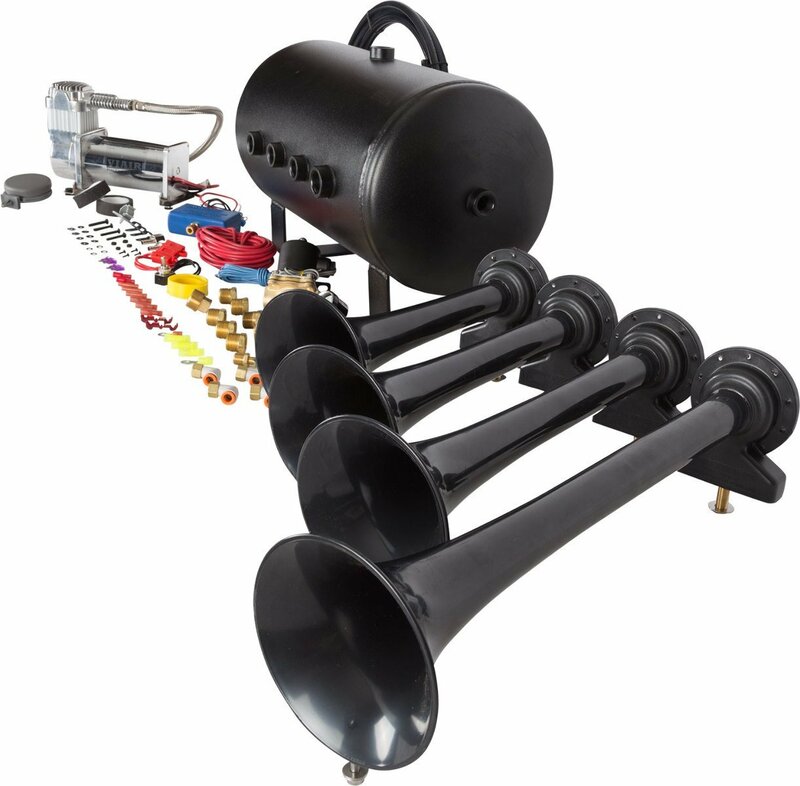 Train Horn Kits are specialty items that are only available specialty stores. Here at TrainHorns USA we have a large selection of the top train horn kits available. All of our kits come with free shipping, extended warranties and a liberal return policy. Choosing the right train horn kit can be a real challenge. That’s why the train horn experts on our staff have written a train horn kit buyers guide to help with your selection. Once you have read this write-up you will be extremely well informed and ready to make the right choice. It’s important that the train horn you select fits well in your vehicle, but also has the sound and decibel level that you desire. Please feel free to contact us and we will be happy to help you with a recommendation. If you are looking to buy for your semi, then you want an all-in-one kit with a large tank for longer blast times.. Horn aficionados buying for their passenger vehicles may opt for a compact kit, which will fit perfectly in the limited space available in a passenger vehicles. However, the larger kits will work fine in passenger vehicles also. While used truck air horns are available, it is better to buy a new kit with the specifications to suit your particular vehicle. Most kits include an air compressor, an air tank, a drain safety valve, tubing, Teflon tape, a tire inflation coil hose, a toggle switch, the hardware necessary for installation, and installation instructions. Prices for big rig and vehicle air horn kits start at under $200 and run as high as $800 or more. Motorcycle horns start at around $17 and go up. You can also buy solenoid activated horns for a less complicated system. Nathan Airchime is one of the first producers of truck air horns. The original sound chime was a D# minor chord. In 1975, Amtrak asked Nathan Airchime for a new sound, and the company made changes in its five-bell air horn to include an A# chord and G# chord. Loud Mouth Train Horns is another producer of these fascinating sound devices. A leader in the market, LoudMouth’s reputation rests on its loud and durable horns. Loud Mouth stands behind their products by offering a 15 day return policy and one year warranty. Hornblasters is a popular major manufacturer of this fun apparatus. Hornblasters boasts of being the first manufacturer to build all-in-one horn kits for passenger vehicles. This company is not only known for its innovation, but also for the fine quality of its product. In addition to our buyers guide and detailed product pages, we have all the installation information you will need to get your train horn kit up and running in no time. We ship all of our products to mainland USA for free. Please don’t hesitate to contact us if you have any questions. We’ll be more than happy to help you out! Worried About Installation? It’s Easy! Now that you have your new sound toy, what laws surround its usage? For passenger vehicles, basically use common sense and don’t cause a nuisance. Be careful with any pranks you play. Also, be considerate of the time of day and neighborhood when sounding your horn. Regarding regulations for train horn usage, refer to Federal Railroad Administration Train Horn Rules for laws and guidelines. Basically, federal law requires an engineer to sound the horn at all public crossings 24-hours a day. Otherwise, the engineer may sound the horn to warn people or animals on the track or construction crews near the tracks. Truck air horns are a fun and possibly mischievous addition to any vehicle, from the bicycle to the truck. They are a practical and necessary part of big rigs, but practicality does have its fun aspects, as well. Whether you are “pimping” an old vehicle or customizing a new vehicle, have fun with the wide selection of kits available for your hearing pleasure.